This yummy salad is usually a regular part of the spread at family get togethers. It is a simple solution for eating healthier and the best part is, you don't have to sacrifice flavor! 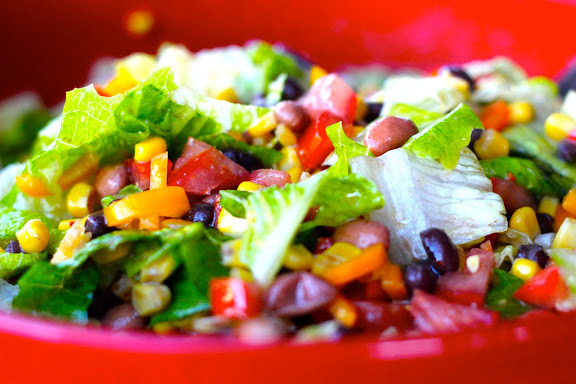 Combine all of the vegetables and beans in a large salad bowl. Then drizzle the salad dressing over the top and mix to evenly distribute the dressing throughout. i believe i had a variation of this just the other day. It had quinoa instead of the iceberg. those bean salads are just great! Okay we are "no vinegar" eaters so I'm always looking for salad dressings without vinegar. Love this! Mmm. Pretty much any recipe that has "Southwest" in the title is delicious. This one is a main dish-er for me - too good to just be a side. i just made this for our [quick, don't know what to make on a saturday night] dinner! so refreshing!!! thank you!